Bowen’s disease is a very early form of skin cancer that is easily treatable. The main sign is a red, scaly patch on the skin. It affects the squamous cells – which are in the outermost layer of skin – and is sometimes referred to as squamous cell carcinoma insitu. The patch is usually very slow-growing, but there’s a small chance it could turn into a more serious type of skin cancer if left untreated. Bowen’s disease itself isn’t usually serious. It tends to grow very slowly over months or years, and there are several very effective treatments for it. 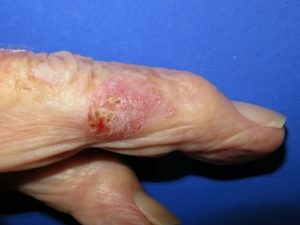 The concern is that Bowen’s disease can eventually develop into a different type of skin cancer called squamous cell skin cancer if left undiagnosed or neglected. It’s estimated this happens in up to 1 in 20 to 1 in 30 people with untreated Bowen’s disease. Squamous cell skin cancer is often treatable, but it can spread throughout the body through the blood, lymph nodes or nerves, and is sometimes very serious. This is an early form of superficial SCC and are typically flat red and scaly and can be treated with topical medication and cryotherapy as well as surgery.